Among Monticello’s treasures is the Jefferson-designed 8-day Great Clock found in the Hall at Monticello. Driven, like the Great Clock, by hanging weights, this distinctive wall clock’s 8-day skeleton movement gives a clear view of the fine precision mechanism. A melodious chime marks each hour. 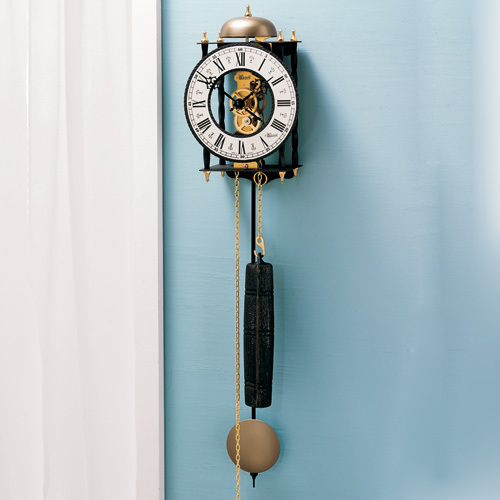 Made by Hermle, the renowned German clockmaker. 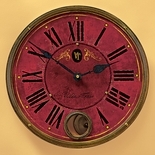 25"h x 6"w x 4"d.
Thomas Jefferson once wrote to his daughter Martha, “No person will have the occasion to complain of the want of time who never loses any.” As his remark indicates, Jefferson was concerned with the efficient use of time. He purchased a large number of timepieces during his lifetime. Some served decorative purposes at Monticello, others were used for practical everyday affairs, and several were acquired for the pursuit of scientific interests. 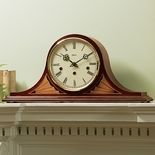 Always fascinated with mechanisms and their functioning, Jefferson also designed clocks. Shortly after his return from France, Jefferson specified the form of the obelisk clock which still sits at the foot of his bed at Monticello. He later planned the Great Clock, mounted in the Entrance Hall at Monticello with a second face on the east front of the house. With its two faces and hour striking gong, the seven-day clock served both the occupants of the house as well as the laborers in the field. 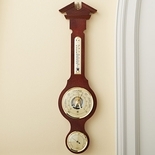 These and other clocks helped Jefferson systematize his daily routine and his schedule of study at Monticello.